online site is confusing. after logging in there is no way to log out. no log out button at all. Have rented multiple units here for years. The new owners truly go out of their way to accommodate you. Was working late moving items recently and the owners stopped by with cold water from their own home! Very caring and professional. I have never had a problem here. Very Secure. Reasonable rates. Highly recommended! Great place to rent . I have rented a storage unit here for years and have only great things to say about how the place is ran. I have known Pat for a very long time and have never had a problem one with anyone there. they have always treated me with a friendly smile. I would recommend this storage unit to anyone. Welcome to Panther Storage of Reno, Nevada! Our facility offers the most complete, comprehensive solution to your self storage needs in the entire area. We’re locally owned and our staff is professionally trained, so you’ll always be able to get the most out of your project. Pick up the phone and call us today! No matter where you live, be it right here in Reno, in Sun Valley, Spanish Springs, Cold Springs, or to the south in Hidden Valley or Sparks, our facility is more than prepared to find you a solution that fits your needs. We’re just off of US-395 at exit 72 on Panther Drive, so you can get here from just about anywhere in a timely manner. Plus, because we’re just two miles north of the University of Nevada – Reno, students can come by and get the space they need for their summer vacation. We know that it takes a lot of trust to place your belongings in a storage unit and then drive away. 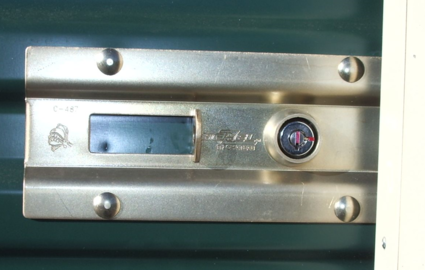 We use a patented Chateau Lock System. Come in and we will show you why we think it is the best lock system out there. Our facility offers perimeter fencing, gated entry, and 48 cameras. Plus, many units are individually alarmed and our manager lives on the property. Try to find those features anywhere else! Our office is open seven days a week, making it easy to speak with our team members to get the most out of your upcoming or on going project. We even offer 24-hour access to your unit all week long. These are just a few of the many ways we make our tenants’ lives easier and provide the best service in town. Reach out to us right away to reserve your space and we’ll get your move going! Current tenents- We've recently switched facility managment software. If you had an account online with us previously, you will need to create a new account with a new account number. Please call the office for your account number! © 2019 Panther Storage, partners and affiliates.